Though most people have heard of narcolepsy, few of them actually understand what the condition is and how it can affect your life. Narcolepsy is a chronic neurological condition that affects about 1 in 2,000 people in the United States, or about 200,000 Americans. This condition can have a significant and sometimes dangerous impact on the sufferer’s daily life and, unfortunately, only about 25% of those who have the condition are receiving treatment for it. When people think of narcolepsy, they think of a person suddenly and uncontrollably falling asleep in the middle of an activity. While this is one of the more serious symptoms of the condition, narcolepsy more commonly causes excessive daytime sleepiness, sleep paralysis, and even hallucinations. Narcolepsy can occur at any age and, because many of its symptoms are shared with other conditions, it can be difficult to diagnose. In this article, we’ll delve deeper into the subject of narcolepsy to explore what it is, its symptoms, and what causes it. We’ll also talk about how the condition is diagnosed and what treatment options are available. The sleep/wake cycle is a predictable daily pattern that determines when your body is ready to sleep and when it is awake and alert. For most people, the ideal sleep/wake cycle includes an average of 7 to 9 hours of sleep (usually at night) followed by 15 to 17 hours of daytime wakefulness. The sleep/wake cycle is also known as your circadian rhythm. Narcolepsy is a chronic neurological condition that affects your brain’s ability to control the sleep/wake cycle. Many people who suffer from narcolepsy feel rested upon waking but become progressively sleepier during the day. For some individuals, excessive daytime sleepiness interferes with daily activity, and they may even fall asleep suddenly and unwillingly in the middle of an activity. People with narcolepsy also frequently experience interrupted or uneven sleep during the night. During a normal sleep cycle, the brain enters the rapid eye movement (REM) stage about 60 to 90 minutes after you fall asleep. It is during this stage that you experience dreams, but your brain typically keeps the muscles limp to prevent you from acting out your dreams. People who have narcolepsy may enter REM sleep more quickly, just 15 minutes after falling asleep. They may also experience the dream activity and muscle weakness characteristic of REM sleep while they are awake, or they may not experience these things while asleep. Though narcolepsy may not be a life-threatening condition, it can interfere with the individual’s social, psychological, and social function – it can even affect development in children and may inhibit school, work, and social activity. Anyone can develop narcolepsy, and it affects men and women equally. The most common age of onset is between 7 and 25, though it can occur at any stage of life. At any given time, it is estimated that between 135,000 and 200,000 people have narcolepsy, but due to the difficulty with which this condition is diagnosed, the number could be much higher. People with narcolepsy are often misdiagnosed with other sleep disorders or psychiatric conditions before an accurate diagnosis is made. Narcolepsy is a lifelong condition that can be treated and managed, but it is unlikely that your symptoms will ever disappear entirely. Fortunately, this is not a condition that tends to worsen over time. The primary symptom associated with narcolepsy is excessive daytime sleepiness. This symptom is characterized by a persistent feeling of tiredness or sleepiness, regardless of how much sleep you got the night before. Unlike normal sleepiness, the kind of sleepiness seen in narcolepsy is more similar to a sleep attack – an overwhelming sense of sleepiness that comes on suddenly and strongly. Between sleep attacks, you may eminence normal levels of alertness. 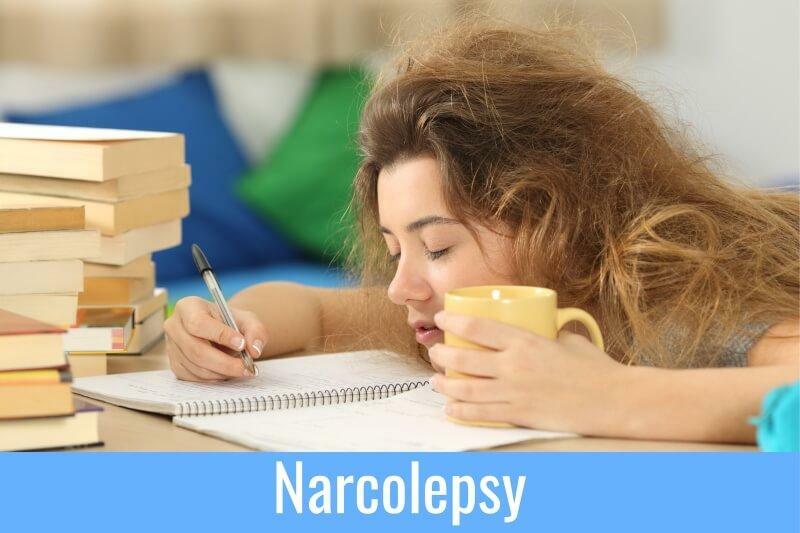 All people who suffer from narcolepsy experience extreme daytime sleepiness, but only 10% to 25% experience all of the other symptoms characteristic of the disease. Cataplexy – This is a sudden loss of muscle tone which leads to weakness and a loss of voluntary muscle control. Cataplexy can be triggered by sudden and strong emotions such as fear, anger, laughter, stress, or excitement and attacks range from mild to severe. In mild cases, you may experience only a momentary sense of mild weakness (such as drooping of the eyelids) while severe attacks may result in total body collapse. Symptoms of cataplexy typically develop months or years after the onset of excessive daytime sleepiness and attacks may occur as seldom as once or twice a lifetime or as often as several times a day. In 10% of narcolepsy cases, cataplexy is the first symptom which often leads to misdiagnosis as a seizure disorder. Sleep Paralysis – This is the temporary inability to speak or move while falling asleep or waking up. Sleep paralysis usually only lasts for a few seconds, but it can last for up to several minutes – it is very similar to the inhibition of voluntary muscle activity you experience during REM sleep. This symptom is similar to cataplexy, but it typically occurs at the edges of sleep. In both cases, the patient remains fully conscious and, even when symptoms are severe, they do not result in any permanent dysfunction. Once the episode passes, people typically recover quickly. Changes in REM Sleep – The REM stage of sleep is when most dreams occur but, in people with narcolepsy, REM sleep can occur at any time of day. People with narcolepsy often enter REM sleep much more quickly than the average person, within 15 minutes rather than 60 to 90 minutes after falling asleep. Hallucinations – People with narcolepsy may experience hypnagogic or hypnopompic hallucinations. The former occur as you fall asleep and the latter upon waking. Hallucinations may be mild, such as a feeling that there is a stranger in the bedroom but can also be vivid and frightening if they occur when you are not fully asleep, and you experience dreams as reality. Insomnia – Though people with narcolepsy often feel excessively tired during the day, they may still have trouble falling or staying asleep at night. Their sleep might be disrupted by vivid dreams, sleep apnea, acting out dreams, or periodic limb movement. Automatic Behaviors – Some individuals with narcolepsy experience temporary sleep episodes lasting no more than a few seconds. If you fall asleep during an activity (such as talking or eating), the activity automatically continues without the individual having any consciousness of what they are doing. This happens most often when the individual is not actively engaged in the activity. Additionally, they may not recall their actions upon waking and performance is frequently impaired. People typically awake from these episodes feeling refreshed. There are two types of narcolepsy categorized by their symptoms. Type 1 narcolepsy is narcolepsy that occurs with cataplexy and diagnosis is based on low levels of hypocretin in the brain. Type 2 narcolepsy is narcolepsy that occurs without cataplexy and is characterized by severe daytime sleepiness without muscle weakness triggered by extreme emotion. There is also a condition called secondary narcolepsy which can be caused by injury to the hypothalamus, the part of the brain that regulates sleep. People with narcolepsy may have other sleep disorders such as obstructive sleep apnea, insomnia, or restless legs syndrome. Some people also experience automatic behavior that occurs during familiar activities (such as typing or driving) and then do not remember the activity upon waking. The causes of narcolepsy are poorly understood, but there are several factors which have been seen to contribute to the disorder. In cases of narcolepsy that involve cataplexy, the individual almost always has very low levels of a naturally occurring brain chemical called hypocretin which regulates REM sleep and promotes wakefulness. People with type 2 narcolepsy usually have normal hypocretin levels. Genetics – In most cases, narcolepsy is sporadic – this simply means that it occurs in individuals with no family history. There are instances, however, of clusters occurring in families – about 10% of individuals diagnosed with type 1 narcolepsy have close relatives with the condition. Brain Injury – In rare cases, narcolepsy is caused by traumatic injury to the part of the brain that regulates REM sleep and wakefulness. It can also result from tumors or other diseases affecting the same area of the brain, the hypothalamus. Autoimmune Disorder – Low levels of hypocretin are a known cause for narcolepsy with cataplexy and abnormalities in the immune system may be related. Autoimmune diseases cause damage to the body when the immune system mistakenly attacks healthy cells and tissues. In the cases of narcolepsy, researchers believe that the immune system attacks hypocretin-containing brain cells due to a combination of environmental and genetic factors. In addition to the causes listed above, there are a few factors which may increase your risk for narcolepsy – age and family history. Narcolepsy typically manifests between the ages of 10 and 30 years old and, if you have a family member with the disorder, your risk is 20 to 40 times higher. There is also a correlation between narcolepsy and obesity, though it seems that people with narcolepsy are more likely to be overweight than for obesity to be a causative factor for the condition. Though narcolepsy is fairly common, it is a condition that frequently goes undiagnosed or is misdiagnosed as another disorder. In fact, public misunderstanding of the condition is one of the biggest complications of narcolepsy. Symptoms of narcolepsy may interfere with your performance at work or in school which could cause problems with the way your coworkers, superiors, and peers view you. Narcolepsy can also interfere with intimate relationships since intense emotions such as anger or joy have been known to trigger episodes of narcolepsy. Because the symptoms of narcolepsy are easily confused with other disorders, the condition frequently goes undiagnosed or misdiagnosed. In fact, the average time between the onset of symptoms and accurate diagnosis is seven years. According to a recent study, nearly 50% of patients with narcolepsy were originally misdiagnosed with conditions such as depression, insomnia, and obstructive sleep apnea. In order to make a narcolepsy diagnosis, your doctor will perform a clinical exam and gather a detailed medical history. You’ll need to provide information about your symptoms including their onset and frequency, and you may be required to complete a sleep journal to track your sleep habits and symptoms over a period of one to two weeks. Polysomnogram (PSG) – Also known as a sleep study, a polysomnogram is an overnight recording of your brain activity, muscle movements, breathing, and eye movements. It can help determine at what stage of the sleep cycle REM sleep occurs and whether your symptoms might be attributed to another sleep disorder such as obstructive sleep apnea. Multiple Sleep Latency Test (MSLT) – This test is used to assess your level of daytime sleepiness by measuring how quickly you fall asleep and whether you enter REM sleep. On the day following a PSG, you’ll be asked to take five short naps spaced two hours apart throughout the day. If you fall asleep in 8 minutes or less on average, it indicates excessive daytime sleepiness. If you enter REM sleep within 15 minutes during at least two of those naps and in the sleep study, there is a very high likelihood that you have narcolepsy. Hypocretin Levels – In some cases, your doctor may actually want to measure your hypocretin levels by drawing a sample of cerebrospinal fluid through a lumbar puncture. In the absence of any other medical condition, low hypocretin levels are a strong indicator for type 1 narcolepsy. 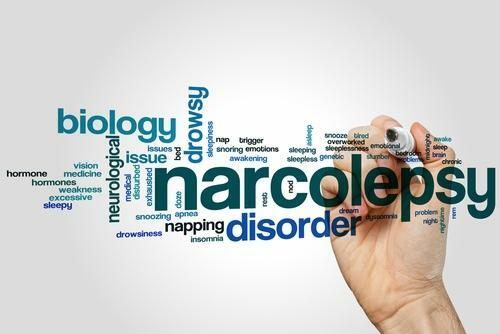 If you experience cataplexy, obtaining a diagnosis of narcolepsy may be a little more straightforward since it is a symptom specific to narcolepsy and occurs in almost no other diseases. Unfortunately, there is no cure for narcolepsy, but there are medical treatments and lifestyle changes which can help with the management of symptoms. In cases where cataplexy is present, however, the loss of hypocretin is thought to be irreversible, though the cataplexy can be controlled with medication in most individuals. Modafinil – A central nervous system stimulant, modafinil is often effective in treating daytime sleepiness and improving alertness with fewer side effects and a lower risk of addiction than older stimulants. Stimulants – Amphetamine-like stimulants may be an alternative treatment in patients for whom modafinil is ineffective. These drugs may help alleviate excessive daytime sleepiness, but there is a risk for side effects such as nervousness, irritability, shakiness, changes in heart rhythm, and nighttime sleep disruption. There is also a high risk for dependence and abuse. Antidepressants – Tricyclic and SSRI antidepressants have been proven effective in controlling cataplexy in many narcolepsy patients. Potential side effects include impotence, hypertension, and heart rhythm irregularities. Sodium Oxybate – Also known as gamma hydroxybutyrate or GHB, this medication has been FDA-approved for the treatment of cataplexy and excessive daytime sleepiness in narcolepsy patients. It is a very strong sedative that is taken twice at night. Lifestyle Changes – Certain lifestyle changes may help you maintain a more consistent state of alertness during the day and should accompany any medical treatment. Such changes may include taking short naps during the day, keeping to a regular sleep schedule, avoiding caffeine and alcohol before bed, exercising daily, avoiding nicotine, relaxing before bed, and avoiding large or heavy meals right before bedtime. In addition to taking medications and employing certain lifestyle changes, people with narcolepsy should also take certain safety precautions, particularly when driving. If you have untreated symptoms, you have a higher risk of being involved in a car accident. Both excessive daytime sleepiness and cataplexy come with a risk of serious injury or even death if left untreated. Even activities that are normally safe (like walking down the stairs) can become dangerous if you suddenly fall asleep or lose muscle control. Though living with narcolepsy can be challenging, there are ways to manage the condition and the Americans with Disabilities Act requires that employers provide reasonable accommodations such as modified work schedules and mid-shift naps. Children and adolescents may also be able to work with school teachers and administrators to accommodate their needs. Narcolepsy is an incurable condition that has the potential to affect your daily life as well as your safety. If you experience extreme daytime sleepiness or other symptoms, don’t delay in talking to your doctor. Receiving an accurate diagnosis is the first step toward treating and controlling your symptoms for improved quality of life.